Young Investors!- Make money in Malaysia and Singapore! : Making money on line? 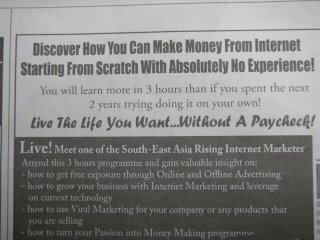 Making money on the internet- a future trend? Hope that you all do not mind that I side track from our usual investment lessons today and talk something about internet. 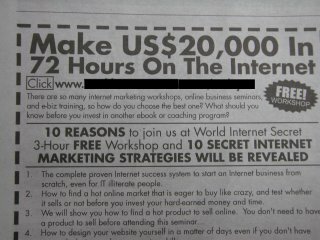 I browsed through the newspaper today before my work and I notice that there were already two advertisements about making money online. For some beginners like you and me, you must be wandering how's the hell a person can make money online if they got nothing to sell? As you remember in my future posts, there are a lot of investment vehicles you can put your money or energy in and these vehicles really can generate income for you. If you were like to think as your great grandparent or grandparent, you must be amused how a 20+ youngster makes US10000 per week through internet. Frankly speaking, I refused to believe this "Ali-Baba" story as well one year ago. However, I know I am totally wrong now, after listening to my friends and attending various seminars, I think it is possible although it is difficult. Yes, you can make money on line and lots of money if you know how. It is a trend every where in the world for people to make money on line. I would touch a bit about "internet money-making ways" in future lesson with my limited knowledge. It is up to you to explore the possibilities!